To get a glimpse of how America’s racial demographics are changing, take a look at the differences between mixed-race Americans old and young. The racial background of the largest group of multiracial babies (36%) is black and white, but just 18% of mixed-race adults claim this background, according to Census Bureau data. Among multiracial adults, meanwhile, the largest share (25%) identifies as white and American Indian; this is more than twice the share among multiracial babies (11%). A similar pattern emerges for mixed-race people whose background is black and American Indian – among adults, the share is 5%, while among babies, it is just 1%. And while almost a quarter of mixed-race babies are white and Asian, this share is just 18% for adults. 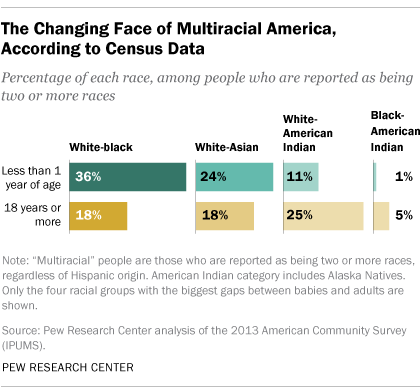 Not only does the face of multiracial America appear to be transforming across generations, but the prevalence of mixed-race Americans is changing as well. One-in-ten babies living with two parents were multiracial in 2013, up from just 1% in 1970, according to a new Pew Research Center analysis of census data. Rapid increases in mixed-race marriages have likely fueled much of the rise in the share of multiracial babies in the past several decades. Since just 1980, the share of marriages between spouses of different races has almost quadrupled, up to 6%, a new Pew Research study on multiracial Americans has found. At the same time, though, a large share of mixed-race babies (43%) are not living with a married parent, suggesting that it’s probably not just interracial marriage, but interracial dating in general that is driving the demographic change.